The mediastinum is divided into superior and inferior, the plane of division being a line from the manubriosternal joint to the lower surface of the fourth thoracic vertebra. The inferior mediastinum is further divided into anterior, middle and posterior mediastinum. Anterior boundary includes the sternum, posterior one being the thoracic vertebral column. 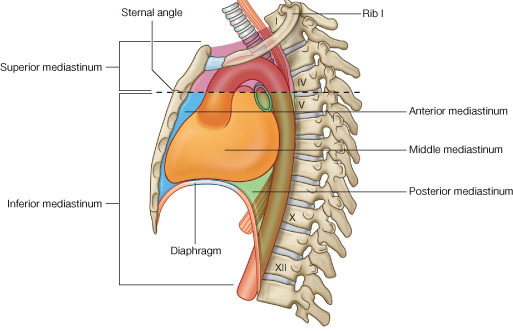 Superiorly it starts at the thoracic inlet and ends at the diaphragm.